Do You Smell Gas? – My car almost blew up. I should continue to watch fiction on TV for educational purposes. I totally think that’s the message the mechanic wanted me to get. Blow something up. Not literally, because that can lead to jail time and missing body parts. But in your writing, where it’s safe, set a scene then blow something up. This exercise is about description. What does an explosion look and sound like? Take five minutes and describe it right now. I’ll wait. Now re-set the scene (places everyone!) and do it again, but this time take away a sense. Describe the explosion from the point of view of a person who is blind or deaf. What would the explosion feel like? Pressure? Moving air? What would it smell or taste like? Sight and sound are often overused in writing when a description of smell or taste or another sensation would do the job as well or better. Spend ten minutes describing your explosion with an unexpected sense. Happy writing. NB. 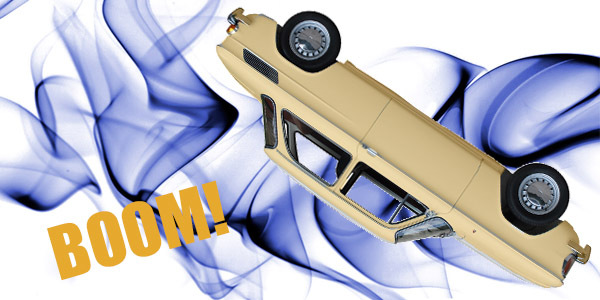 Now I want to write a story where things that shouldn’t happen do…Cars blowing up when they flip. Dice that roll 12 too often. Cockroaches that are attracted to light. Ahhh TV. You not only raised me, but you continue to inspire. ← I Lost My Phone – And it was great!